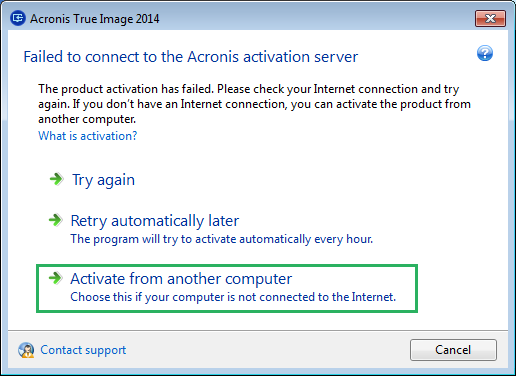 Acronis True Image 2014 needs to be activated on the computer where it is installed. Activation should be performed within 30 days after product installation. 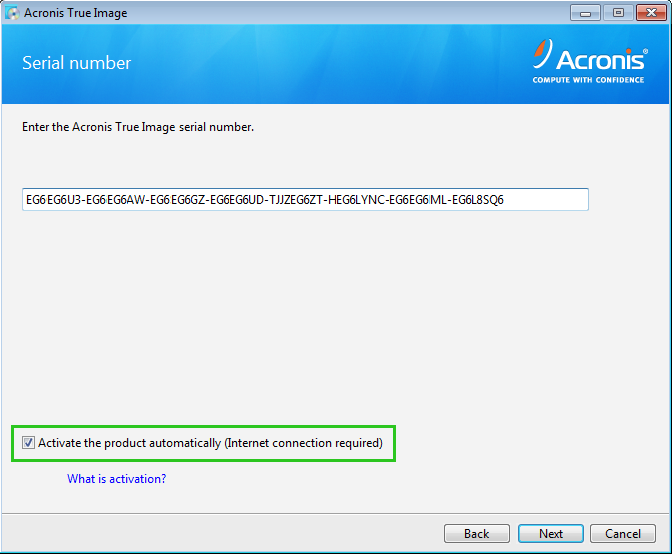 If the computer where you install Acronis True Image 2014 is connected to the Internet, you can activate the product automatically during installation or after installation. In case the computer is not connected to the Internet, the product can be activated from a different computer that has Internet access. 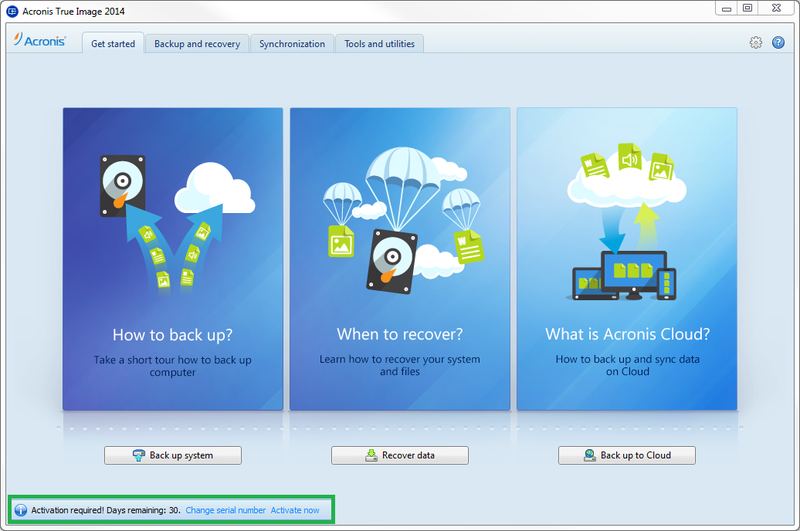 After installation, the program will automatically connect to the server and activate Acronis True Image 2014 on this computer. The status will change to Activated. If you experience any issues with automatic activation, follow the instructions from the third section of this guide, Manual activation from another machine. You do not need a second computer, everything can be done on the same machine where Acronis True Image is installed. 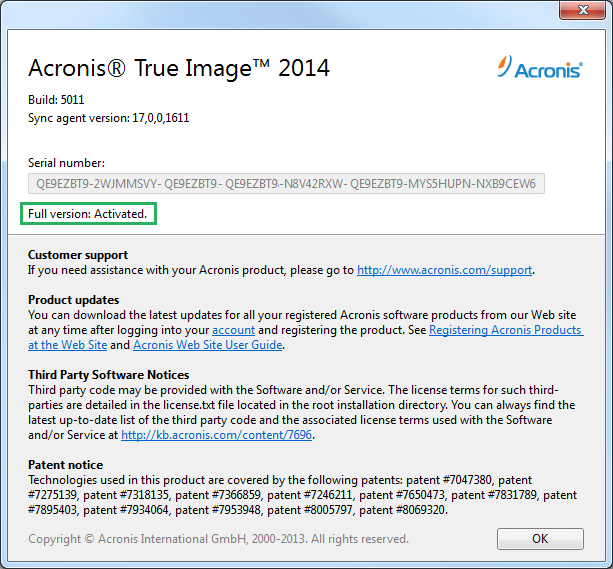 The product will connect to Activation Server and your copy of Acronis True Image 2014 will be activated. If you experience any issues with activation, follow the instructions from the third section of this guide, Manual activation from another machine. You do not need a second computer, everything can be done on the same machine where Acronis True Image is installed. If the installation and/or activation codes are not accepted, repeat the procedure using Windows Clipboard instead of files method: hit Ctrl+C key combination to copy the selected code and then Ctrl+V to paste it. In case if this method does not work either,contact Acronis Customer Central, providing step-by-steps screen captures of your actions and the installation/activation codes you have used.